Before you buy a bunch of discounted LED lights for next year’s Christmas tree, you might want to consider putting that money towards a projector instead—one that’ll guarantee that your living room holiday decor will far outshine your neighbor’s. 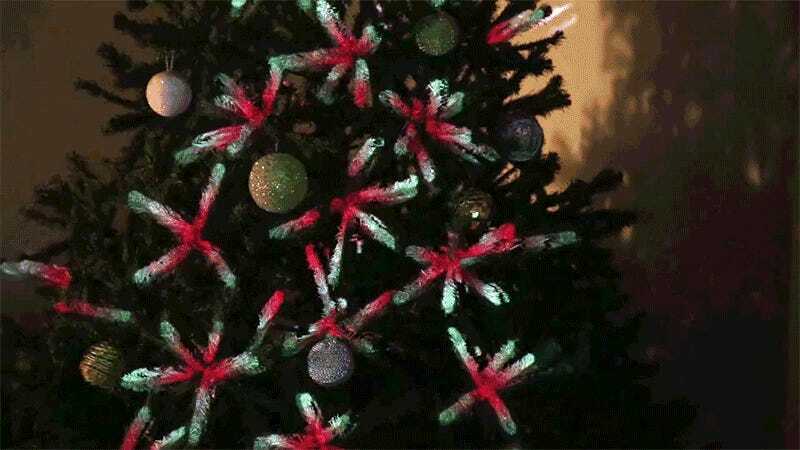 A Brazilian design studio called Ambos created this spectacular Christmas tree by first modeling it in 3D, and then using the popular Processing programming language to create a custom mapping tool that makes the tree come alive with a projected animation. Using a projector for decorating a Christmas tree also makes cleanup a whole lot easier come the new year, because all you have to do is switch it off, and then toss the tree to the curb. There are no precious ornaments to delicately remove and pack away, and not a single strand of lights to untangle.